As a newcomer to the world of whiskey, I hope to offer my aid not to those well versed in the intricacies of whiskey and their depth of taste, but instead to the newcomers who are still finding their preferred tastes. This whiskey is a phenomenal drink, let me first begin with that. Previously my favorite was lagavulin 16 year malt, but after trying this about 20 minutes ago I felt inclined to write a review because of how beautiful it tasted. So let's get in to that beauty, shall we? This Glenmorangie here is sweet to the nose, as others have said, but with a complexity that is more pleasant than any other sweet whiskey I've smelled. Beyond sweet, I suggest the reader to try it on their own, I trust you will not be disappointed. As for the taste I wish not to delve in too deep, as I do not have the experience and I hope not to discourage those new to tasting who may find an in depth pallet dissection intimidating. So all I will say is that I have tried many whiskeys and this stands to be both the most complex and smooth at the same time. None will take a sip and think of anything else but of spring and happiness. To use a word I only recently learned, you will not go wrong buying this "dram". Please do so. Dear @Joemoe , thank you for your nice review. Have you ever tried Glenmorangie Signet? I quess it's worth to get a sample of it at least. @NamBeist I have heard of it! I'll. Be trying it when I get the chance. The 18 Years Old is a single malt Scotch whisky that under goes a specific maturation process. According to the folks at Glenmorangie the spirit has spent fifteen years maturing in American white oak casks and about 30% is transferred into Spanish Oloroso casks to spend a further three years maturing. Then, when both spirits have reached 18 years, they are blended back together to complete the finished product. This has been breathing for 10 minutes as per my usual procedure, neat and in a simple whisky tumbler. It has a lovely clean gold amber colour. On the nose rich, and sweet with a definite sherry influence, floral, fresh with honey scents. A small sip reveals an initial burst of sweet spirit, a bit fiery at first. The subsequent sips allow a zesty orange-lemon interplay to occur. As you allow it to coat the mouth some almond and vanilla, along with some burnt sugar appear. Adding a few drops of water causes the zest to fade and allows the subtle vanilla, fruit, some apricot, pineapple and even … banana to be discovered. Bottled at 43% ABV. the rare 18 has a noticeable but not powerful finish. Well balanced. It retails for about 80 GBP in the UK, that’s about $125 US, and in (LCBO) Canada $194. Score 89/100. @whiskydallas. Very nice review of a very nice whiskey. The 18 Extreme Rare is a favorite, very clean and balanced whiskey. I actually like all the Glenmorangie expressions, I have tasted. The citrus is a common theme found in them. Thanks for the kind words.I happen to agree, clean spirit with citrus theme does seem to common to their expressions. Cheers! Here is another very good malt from Glenmorangie that is aged very well. I just don't think that it is worth the price, which drops the score. It was tasted in one glass at the bar and deemed not worth buying again. Really? I had a glass of this for the 1st time a few days ago, also at a bar, and thought it was exquisite. Floral, buiscuity loveliness, and oh-so smooth. Maybe you like a 'kick' in your malt, that would explain whi this doesn't do it for you, as it is quite subtle? Resounding titles such as Extremely Rare immediately make you want to try this dram. So I got me a sample of this Glenmorangie at a festival in Ghent last February. After maturing on bourbon for 15 years, it got a three year long finish on oloroso sherry casks. The nose is honeysweet and floral. All kinds of honey and vanilla custard, wrapped in spring flowers. Mildly fruity on yellow plums and yellow raisins. Sultanas, they are called. Evolves slowly but surly into orange juice with a shot of grenadine. This is spring in your glass. On the palate, too, it is sweet and somewhat creamy. A little pepper and pinch of nutmeg offer a mild bite. Orange and prune marmalade with quite a lot of vanilla. Midpalate, a slightly metallic touch emerges. I am again reminded of orange juice. Make that lemonade. Not bad, but rather docile to be honest. In the medium long finish, which remains very sweet, some drying oak rears its head. Absolutely good whisky, especially if the sun is out. But no matter how extremely rare this may be, it is not extremely overwhelming. Extremely sweet, yes. Around 70 EUR. I had the privilege of tasting this fine malt and I must say you are right on on your description. I also tasted the Macallan 18 that same evening and did a comparo side by side along with the Glenmo 18 and I enjoyed it more than The Macallan. I found it more delicate and complex with its mix of sherry and its unmistakable perfumes and oranges that only Glenmos are known for. I found the Macallan and its Sherry influence over-the-top. This is a good and fine whisky of Glenmorangie. I love the diffent kind of styles of this great selection of Glenmorangie. I fill my glass with this fine whisky on a rainy winter day, put some Folk music on and enjoying this great dram. The nose gives me quite spicy notes, sugary and with bits of floral. Sweetness of fruits. The taste is complex, quite minty, fruity and brings a sweet strong aftertaste. The finish is long, tingles with little woody elements and honey like. It is! And it was just a perfect atmosphere. Rainfall, Folk music and Glenmorangie 18 yo. Just fantastic. Now I put a review on for another masterpiece of Glenmorangie...the Finealta. Hope you like the review as well. There's nothing like a dram and a good bit of folk music on a rainy day! The 18 year old has may of the usual characteristics of Glenmorangie. It's true that Glenmorangie's Signet is the best bottle they have available right now. 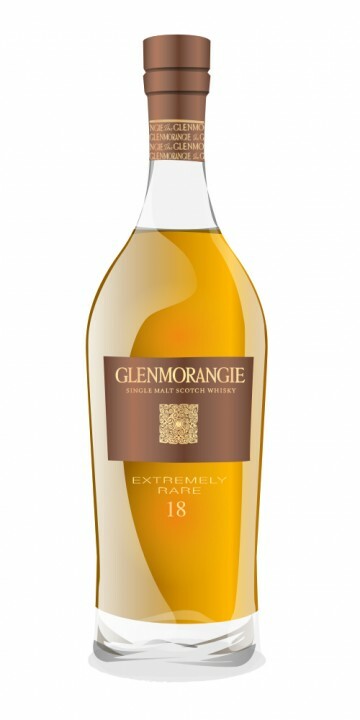 Though, at half the price, the Glenmorangie 18 Year Old is remarkably close to the Signet in terms of enjoyment. It's nose is more floral and less complex and its flavor it lacks some of the rich chocolate of the Signet, but it was definitely produced by the same craftsmen and it has a hint of smoke on the finish that is very nice. Compared to its younger sibling, the Original 10 Year Old, it is far more complex, smooth, and refined. It definitely hits the sweet spot between the very good entry level Original 10 Year Old and the high end Signet both in terms of quality and cost. Nose - Honey, and buckets of it. A Real tang of Greek yoghurt, and more than a touch of Grapefruit. Palate - Delicious Honeyed Smoothness, less barley than one would expect. Finish - Very long, Honeyed, lifted by a lovely citrus-peel freshness right at the end. Not particularly complex, but a very refreshing citrus-driven dram worthy of attention. Can you get more complexity for £80? Certainly. But it's easy to forget that not everyone is looking for complexity. Glenmorangie have made no secret of their move towards a "Luxury Brand" with this product (due in no small part to the owners - Louis Vuitton, Moet, Hennesy). They've pulled it off remarkably well. @benellefsen How does this stand up against other 18 year old whiskies in your opinion? In terms of value for money?